This weekend, I am participating in a yard sale. Trying to declutter and downsize some more. A few years ago I found a fabulous article from Real Simple and I thought I would share it with you all in case you are getting ready to have a yard/garage sale yourself. I've had a few in the past couple of years and I have learned that you can get quickly overwhelmed, so planning is a must. 5. My main goal is not to have to haul anything back or to the Goodwill when I am exhausted from a day of sun. So as if gets closer to noon, I personally get more generous! In fact, noon is my max time out, the customers start to dwindle around 11am. Do you have any tips for a successful yardsale? Oh, yard sales! My mom is an expert yard-saler and she has it down to a T. I like all of your suggestions, esp. about pricing your merchandise! My other advice would possibly to have a wingman to help you, like your BF or a friend, so that you don't get too overwhelmed, you know? But you probably already have a helper! Whenever our yard sales are over we take our leftovers to this church that accepts EVERYTHING to give to poorer folks. It's a good feeling! Hope you get rid of a lot and make some $! Enjoy your yard sale! Good reminders. We're probably having a leaving-island yard sale late May, of whatever we haven't already sold by then. haha...it was a crazy way to start the day..
i hope you rake in the cash! and i hope you have a place to sit in the sun! i'd say try and display things in an attractive and organized manner. if things look like a mess i think it is a turn off. but maybe that is just me! that sounds like fun! I've always wanted to have one- good luck!! Don't let people into your house!! I know a yard sale is held outside only, but we once had the glorious idea since we wanted to sell almost everything (before a move)to open the house up and it was an invasion! Great tips! I've only done one yard sale and was absolutely shocked at the response! It's such a fun (and exhausting) thing to do! Best of luck! Good luck, hope you have fair weather and reap in some cash while losing some clutter. Pricing everything is wise. Do get someone to help if you can. Don't let anyone talk you down on the price you set, unless they're buying multiple items. Be willing to deal, but don't let them take advantage, someone else will come along who will pay the price and take home a real treasure (like those seashells). Have fun and wear sunscreen! Oh, sell lemonade. Works great on a hot day and your shoppers will appreciate it. 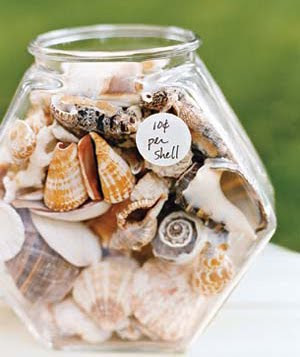 Somebody should have bought that whole jar of shells just the way they are- so cute!